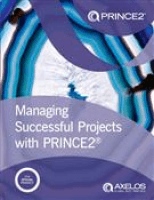 Managing Successful Projects with PRINCE2 is the official PRINCE2 manual and details all of the PRINCE2 processes, components and techniques that enable individuals and organisations to successfully deliver their projects within time, cost and quality constraints. The updated 2017 guidance, its first since 2009, places a strong emphasis on the scalability and flexibility of the method and on how best to tailor it to the complexity and specific requirements of a project. The new 2017 edition publication is the manual from which the syllabus and the examinations are set and supports the new updated PRINCE2 qualification for both Foundation and Practitioner examinations. By buying this item you would be purchasing the pdf version of the manual. IMPORTANT: This PDF is DRM Protected and is compatible with Adobe Digital Editions. You must Install and Authorise Adobe Digital Editions 1.7.2 to continue. Download Adobe Digital Editions for free from the Adobe website. Please allow 48 hours for delivery of your PDF.